Let me explain this reference for the sports fans who may not be familiar with the ways of Asia’s Songbird. Regine Velasquez, she whose high notes go higher than the combined height of five Greg Slaughters, had a father who trained her to have strong lungs by singing vocal runs while swimming in the ocean. The Arellano Chiefs’ point guard Levi Dela Cruz went through much the same, except instead of vocal runs, it involves rice and road running. Dela Cruz grew up in Toril, a seaside district of Davao City. His father, Levi Dela Cruz Sr., was a former forward in Mindanao’s commercial leagues. Even when his kids weren’t particularly interested in basketball, he made sure they had the highest quality ball in the village. But unlike other kids in the area, let alone what you’d expect from a child of an athlete, Levi didn’t grow up joining basketball camps or wanting to become a varsity athlete. When he did, Dela Cruz Sr. didn’t enroll his son in a basketball camp, but instead developed his own training regimen for skills and conditioning. Part of that was running seven kilometers in under 30 minutes. Every morning, Dela Cruz Sr. would wake his son up at 5:00 AM and light a fire under a pot of uncooked rice. The kid would bolt out the door and run as fast as he could along their agreed path, because it would be up to him to turn off the stove. If he got home in under 30 minutes, he could have a big serving of warm, fluffy rice for his trouble. If he didn’t make it and the rice was burned, Dela Cruz and his siblings would have to eat the “tutong” before going to school. Dela Cruz Sr. mixed this road running with uphill and trail running, and Dela Cruz would run through the nearby hilly areas and forests. There were no off days, either. When it would rain and the path would be muddy, they’d go to the sea, wade in waist deep and run laps. 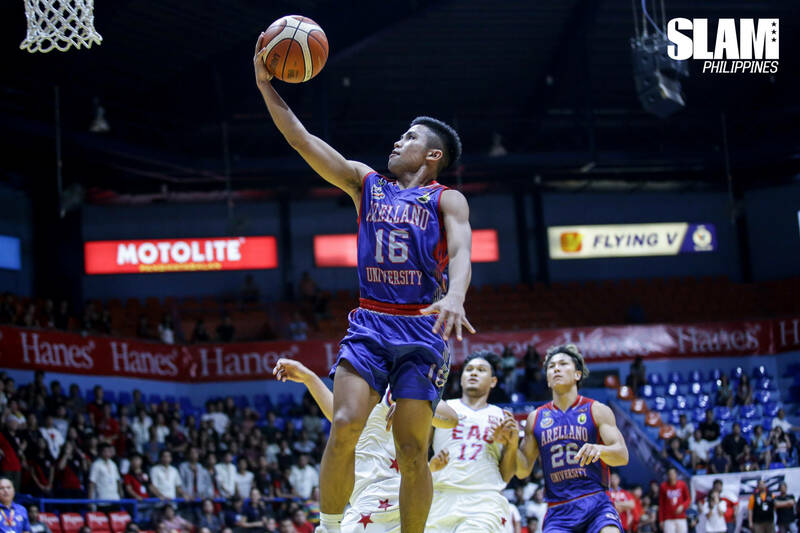 The 5’7” guard now follows in the footsteps of Arellano’s past high-energy Mindanao-born guards like Jio Jalalon and Kent Salado. Dela Cruz is the stockiest of the three, though, with the bulky thighs of a powerful sprinter. But more than physical prowess, the most important takeaway Dela Cruz learned from his dad’s training was patience and perseverance. This is what prepared him to step up after the unexpected departure of Salado, to make that game-winning shot in their upset of San Sebastian. As he settles into his role as lead point guard for the Chiefs, Dela Cruz is counting the days until his dad can watch him play in Manila.